At various stages of his life, the celebrated American writer William Faulkner (1897-1962) presented himself as a literary dandy, a shabby bohemian, a humble farmer, a courtly lover, and a genteel but aloof Southerner. In private and public, he was masterful at making people wonder who he really was. As Kirk Curnutt acknowledges, Faulkner was first and foremost a storyteller. 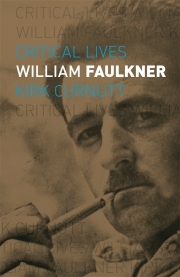 Faulkner’s experiments in style and form radically challenged conceptions of the American South, race and the experience of time in narrative. Beginning with the 1929 publication of The Sound and the Fury (his fourth novel), Faulkner produced a dazzling series of masterpieces – novels and stories that alternately exhilarated and exacerbated critics and left readers gasping to keep pace with his storytelling innovations. He created his own microcosm in which compassion and honour struggle to stand up to the violence, lust and greed of the modern world. As prolific as he was, his career was neither easy nor carefree. Faulkner from the outset was strapped for cash, burdened with supporting a large extended family, ambivalent towards a marriage in which he felt honour-bound to remain, and vulnerable to alcoholism. This book examines how he strained to balance these pressures to pursue his artistic vision with single-minded determination. As generations of readers have struggled to appreciate, understanding the relationship of Faulkner’s life to his art is not a matter of discovering the ‘man behind the myth’; it is of learning how the man created the myth. Kirk Curnutt is Professor and Chair of English at Troy University, Alabama. His most recent books include Reading Hemingway’s ‘To Have and Have Not’ (2017) and American Literature in Transition, 1970–1980 (2018).